We arrived in Florence on Friday lunchtime and soon found ourselves stood face to face with the city’s most infamous landmark. 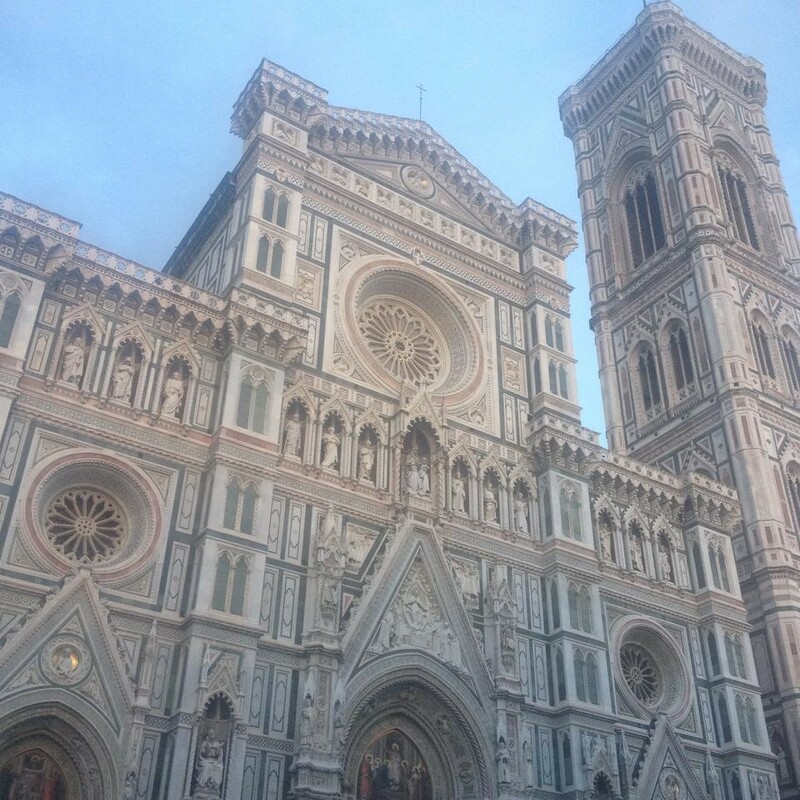 The thirteenth-century Il Duomo di Firenze, loomed in front of us in the bustling square. Awestruck by its Gothic greatness, we crept cautiously up the steps to its enormous doors and were immediately humbled by the bright, airy and peaceful space inside. We sat for a while and took in the detailed artwork painted on the magnificent dome. 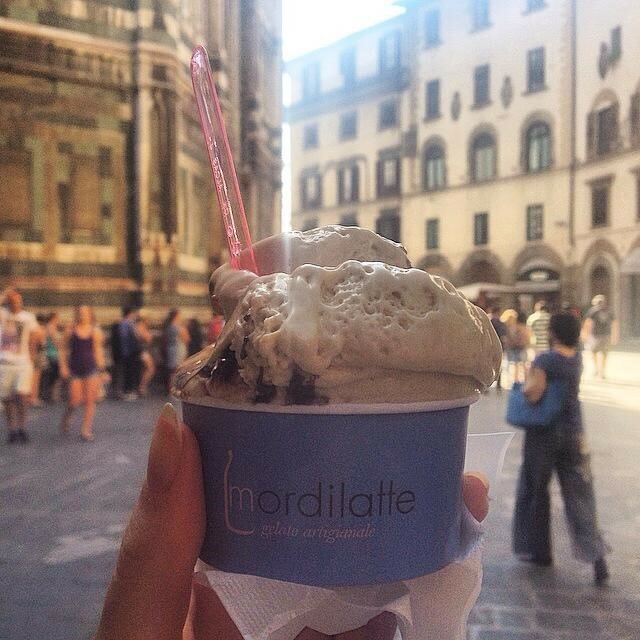 Next we turned down one of the tiny streets off of the Piazza del Duomo and found an amazing gelateria, a recommendation from a friend, which served legendary Cremino flavoured gelato! We enjoyed our tubs sat in the sunshine opposite the Cathedral. Perhaps one of my most memorable ice creams ever! We had pre-booked tickets to visit the Uffizi Gallery on Saturday morning, so as to avoid the weekend ques. Perhaps the greatest treasure trove if Renaissance art in the world, it was certainly one of the highlights of our trip and we did our best to see as much as the prestigious collection as we possibly could! After hours exploring the different rooms in the Uffizi, we did some window shopping on the Ponte Vecchio and took some really edgy photos next to some graffiti… You might say we were inspired by the incredible artwork we’d seen earlier in the day! In the evening, we watched some street artists near our hotel and then enjoyed some rustic Italian pasta in one of the restaurants alongside the Duomo, which to our surprise, was very reasonably priced considering its spectacular surroundings! 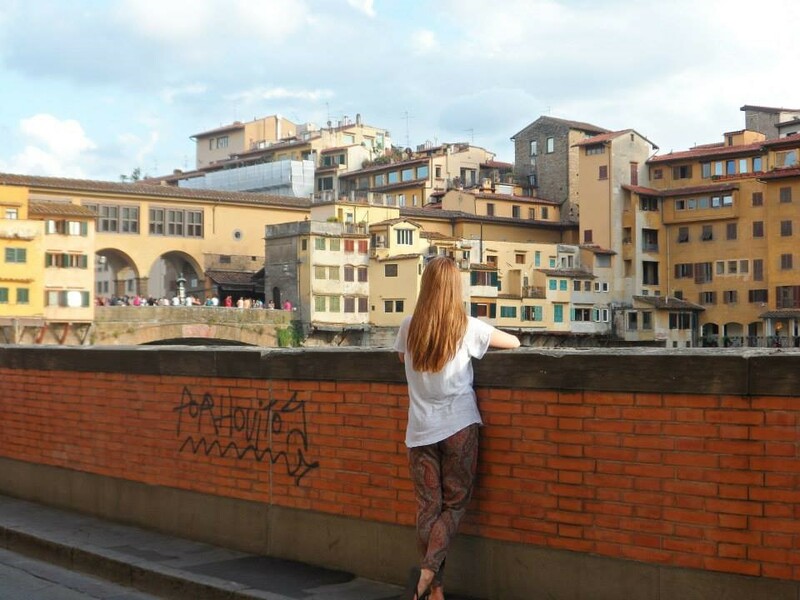 Then we decided to experience for ourselves some of Florence’s vibrant nightlife, and so we crossed the Ponte Vecchio to Piazza di Santo Spirito, renowned for its lively bars, where we enjoyed cocktails on one of the outdoor terraces. 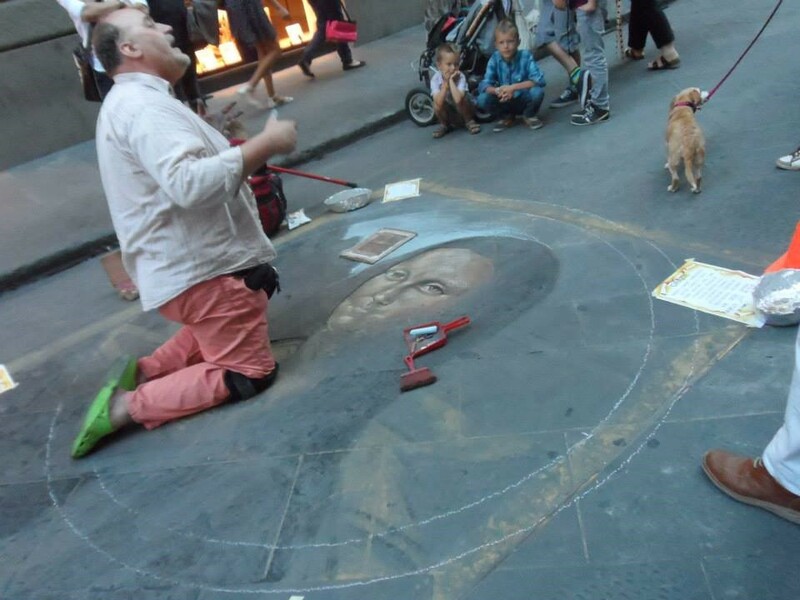 A street artist working his chalk magic. On our final day, we woke up early to pack up our room and store our luggage, so as to make the most of our final few hours in the city. It was another gorgeous day, so we decided put on our trainers and walk up the many steps to Piazzale Michelangelo, to take that perfect postcard shot of the city. As you can see, it was well worth the climb and the perfect way to end our visit. 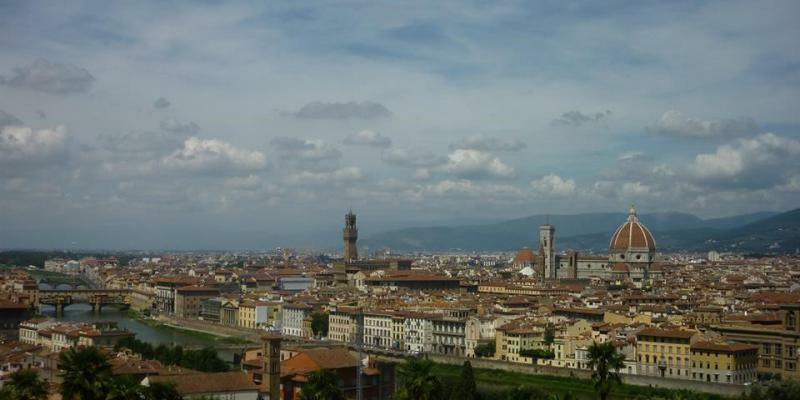 Stunning views of Florence from the Piazzale Michelangelo. After collecting our luggage and making one final stop at our little gelateria next to the Duomo, it was time to leave beautiful Florence. We started off on the short walk back to the train station, sad to be on our way home and not quite ready to accept the amount of gelato we’d eaten in the past 72 hours! Do you fancy an Italian city break? 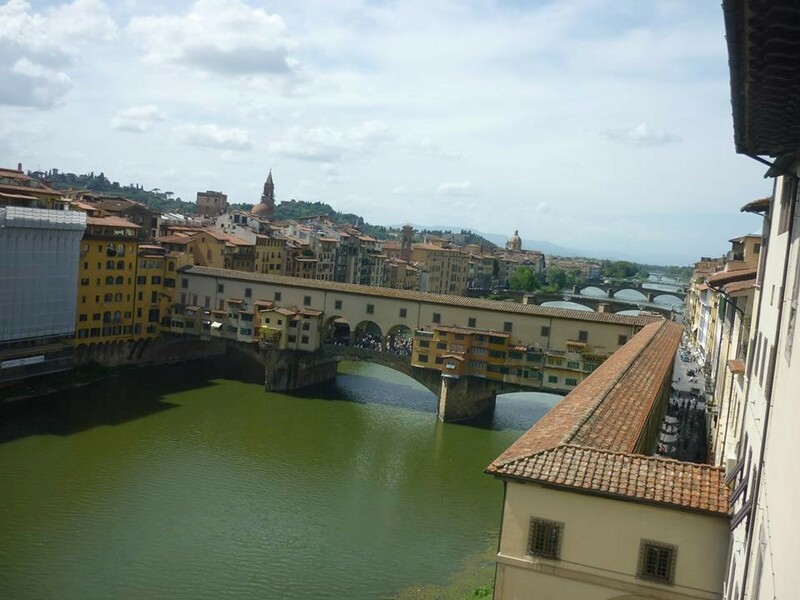 Take a look at our apartments in Florence..